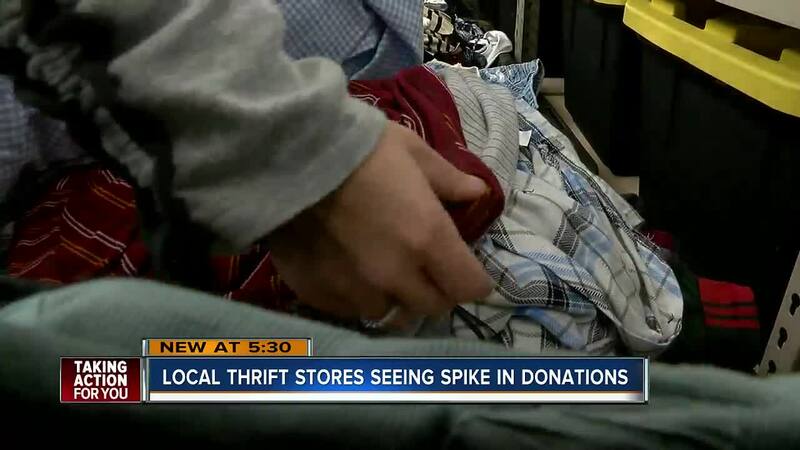 Thrift stores filling up with donations could be related to popular new Netflix show "Tidying Up"
There’s a new trend encouraging people to “de-clutter” their lives and local thrift stores are benefiting from it. The host is Marie Kondo. The method: Get rid of anything that doesn’t spark joy when you hold it. And it’s catching on. "Oh I’m like embarrassed by this area right now, it's so full," said Amber Watt, owner of "Uptown Cheapskate." Watts says she’s seen a huge increase in people bringing in clothes to re-sell at her Tampa Palms thrift store. "This is much more than normal," said Watt. Watts says the reason could be from people cleaning out their closets after Christmas and needing extra cash. She says it’s really too soon to tell if the new show is the reason. But other thrift stores are embracing the Marie Kondo method. And Goodwill Suncoast says after Kondo’s book came out donations have been up 3-percent with 61 million pounds of donations last year in 10 counties. Other Goodwills around the country are posting about the show on Facebook, encouraging people to donate. Goodwill cooperates says they intend to watch numbers in the coming weeks to track if there is a Kondo effect. As for thrift store shoppers, this is good news.